Adam Thoseby in action. Picture by Tom Bennett - Razorlight Imagery. 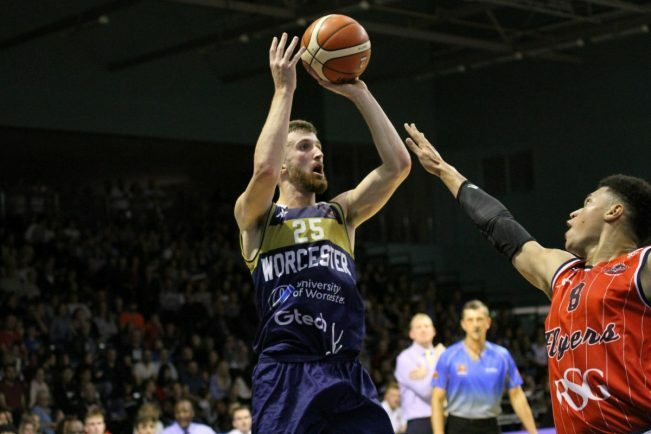 WORCESTER Wolves director of basketball Ty Shaw has revealed his pride in his side after they came to within three points of an amazing comeback victory against Bristol Flyers at the University of Worcester Arena. It looked like a hopeless cause for Wolves as they trailed 43-68 at the third quarter interval in front of a hushed Wolf Pack. 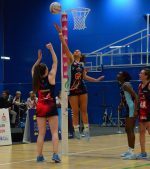 But a combination of hitherto unseen defensive grit and accuracy at the offensive end brought spectators to their feet, obliterating the arrears and leaving the sides tied at 77-77 in the last minute of the contest. Bristol’s Justin Gray missed a three-pointer. Worcester’s Robert Crawford took the ball but was adjudged to have stepped out-of-bounds, leaving Flyers to now succeed with their subsequent long-distance attempt. Miki Servera held for Wolves’ final possession before shooting wide of the target. Crawford grabbed the rebound but was similarly cruelly adrift of the mark. “To come back from twenty-five points down to tie the game up was fantastic. I couldn’t be more proud of the guys for their effort and intensity in the final quarter,” Shaw said. Wolves’ structure took an early blow when bustling forward Filip Kramer was forced to the bench with two quick fouls. Clever assists from Servera for newly-signed guard Darell Combs and Daniel Johnson-Thompson levelled the scoreboard at 24-24 as the second quarter began. Crawford was another Worcester player finding himself withdrawn from the action for the remainder of the first-half after he committed his second and third fouls in swift succession. A 29-38 half-time deficit worsened during a disastrous third period. Careless ball-handling saw Wolves limit their own opportunities to flourish while being unable to hold back Bristol’s attacks. A double of dunks to close the quarter saw the visitors in their pomp. An Adam Thoseby driving layup and a follow-up three started the fightback. Crawford and Combs also connected from outside to rattle Flyers. 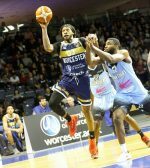 Buoyed by new-found belief, Wolves now wove to the basket with ease and at the same time steeled themselves on defence to harry Bristol into repeated bad passes. Combs led the scoring with 21 points, closely followed by 19 from Thoseby. Crawford was Wolves’ only other double-digit scorer on 14 points. Wolves return to league action next Friday when they welcome the Manchester Giants to the University of Worcester Arena (tip off 7.30pm). * WOLVES are one of the teams tackling the new British Basketball All-Stars Championship at London’s Copper Box Arena this Sunday. Last season’s eight top teams make up the tournament with a raft of one-off features including 12-minute matches and a 5-point line.